For several reasons. Firstly, I am the kind of person who needs activity. I’m not one to sit at home complaining, but rather I try and do something to change things. The second reason is related to the concept, and desire to reduce my own packaging waste. Finally, the fact that it is a citizens’ initiative appealed to me. Therefore when I came across the flyer that announced the February 2016 meeting to present the project, I decided to go and see what it was all about. I came out convinced and ready to become involved. You were elected to the Board of Directors at the last General Assembly. What was your motivation? As I explained, I followed the project almost from the beginning. I also quickly got involved in the bike delivery project and joined the corresponding working group from its inception as a subgroup of the planning group. It is therefore in the vein of this commitment that my interest was stirred when the members of the Board launched their call for applications. As far as the bicycle delivery project is concerned, I would like to reassure our members that the project is still under study and is progressing. For the moment, the realization of the delivery website is slowing us down, as it requires more funding than expected. There are also several concerns that have been expressed ethically. 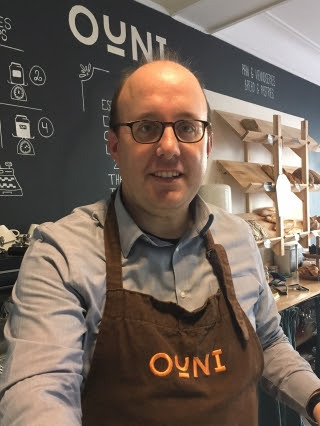 Some fear that this system will reduce the presence of customers in the store and thus undermine the lifestyle and consumption that OUNI advocates. This concern is legitimate, but in my opinion, it will provide an essential service for a shop whose way of operating makes the shopping heavy and therefore difficult to transport on foot, and is a solution to overcome the parking difficulties. Do you have a memorable experience at the shop? I immediately think of two things. First, as a member of the planning group, I had the chance to participate in the selection of the store, with Caroline and Anne. To have seen the empty space and to see it converted today and full of life is rather exceptional. The second thing is the relationship with my shift buddy, Pierre, whose commitment is exemplary. We meet once a month on Monday evenings, and since the opening of the shop, he never missed a single shift and always arrives in a good mood, which makes those two hours a real pleasure. This linking with another person through work is another benefit of OUNI that is too often underestimated, and I hope that many other active members have “their” Pierre. More than a product, it’s the whole range of cosmetic products that I am a fan of. Soap, shampoo, shaving soap, toothpaste, deodorant… I tried them all and continue to use them. I am delighted with this discovery, especially since it is difficult to find such products elsewhere. Another bonus: they are very practical for travelling, which I do often enough to practise sailing. Finally, they last a long time, which, incidentally, is not very good for business!